We remember several years back, when text messaging was first becoming popular, we went to a bar which had a huge television that would display text messages sent to a particular number. This sounds like a novelty, but in a large group of folks who know one another it’s the sandbox of social games. Wanting to tap in on that fun for his New Year’s Eve party, [James] built this countdown timer that includes an element of SMS interactivity. The rig is projector based. A computer using Processing does the majority of the work but [James] needed a way to accepts text messages (the locale of the party had no Internet connection so this was the best bet). He grabbed a GSM shield and his Arduino Leonardo. The bulk of the evening the display showed the last few messages received, with a small countdown timer in the lower corner. 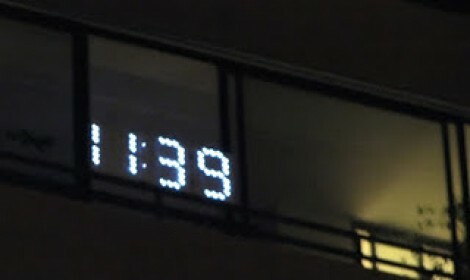 As the countdown approached zero the time was given prominence as in the image above. We guess he was lucky to find a prepaid SIM card that allowed free incoming text messages. Our cell provider charges us 20¢ for each. You might give this one a whirl next year. If it’s not quite your thing take a look around. We’ve seen a lot of fun setups like this mini ball drop. [Rod] is in a position to provide a community service on New Year’s Eve. He spends the evening at a relative’s house next to the beach. There are fireworks at midnight, but the crowd has no communal way to count down to the deadline. This year, he build his own count-down display so that everyone can join in during the last few seconds. This is a temporary build so each digit is housed in a cardboard box. [Rod] first drew the outline of the seven segment digit on the front, then added holes for three LEDs in each segment. He’s feeding the segments with 12V and therefore is able to run the LEDs in series, along with a resistor, switching each segment with one transistor. He chose an Arduino to drive the display, and since he had two sitting around, used both instead of grabbing a shift register as port expander. If you’re looking for a more permanent solution, we really like the digit displays designed for this scoreboard. But you’re going to have to etch the boards yourself if you want them done in time for the festivities.